Before I try to impress you with credentials, accomplishments and experience, I want to introduce myself on a personal level. I love change. I love helping people create their change. I am passionate about seeing people make good decisions from well thought out options and choices. I get excited when people say “thank you” or give me a hug of appreciation. Nothing brightens my day like a new or different perspective. Watching people see the same and sometimes long term problem in a different light or from a different angle is exciting for me. New, different and out of the ordinary usually lead to feeling, thinking and acting “another way”. When people stop doing what does not work or make adjustments of any size or on any level, then improvement is inevitable. That is where my passion kicks in – let’s create change together! A little extra for my clients is provided by my therapeutic assistant. 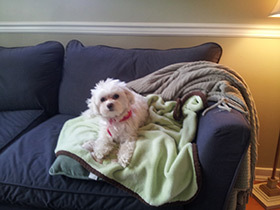 She is a 5 lb ball of white fluff – the famous Bugsy Malone. She accompanies me to my therapy office on most dates to help counselling clients relax a little more. She provides a warm greeting as well as a nice send off when we are finished. Some of my clients prefer to see Bugsy instead of me and some will only book an appointment when Bugsy will be sure to be there. Enough of the personal information, now let’s get to the formalities. I am registered as a Certified Canadian Counsellor with the national counselling association, The Canadian Counselling Association (CCPA) and I am also registered with www.counsellingbc.com. I renew my certification annually by meeting the education requirements and insurance qualifications (Marsh). My formal education is in psychology and my credentials include a Masters degree (University of Northern British Columbia) and a Bachelors degree (Honours) from the University of Regina. I am also a trained mediator through the Department of Justice (Saskatchewan). If you want me to give away my age, I have been a therapist for over 14 years. The list of issues that I have dealt with and am qualified to deal with, could be its own website based on size and variety. Rather than provide a lengthy and exhaustive list (or attempt one), I will keep it simple. If I am able to provide professional clinical services to you and your situation, then I will. If I am not qualified or the best professional to help you, then a referral will be made to find that right person, program or group. At present, my clinical practice makes up only part of my work week. 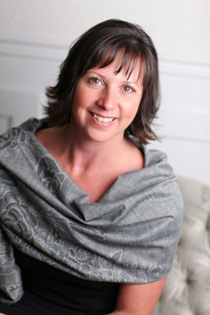 I am passionate about change through counselling and beyond and have developed three divisions in my company. The first is my clinical practice where the focus is therapy and counselling for individuals, couples and executives. The second division is performance management (www.thepossibilities.ca) where the focus is training, consulting and coaching with companies. The third division is focused on exit strategy management (www.strategytoexit.com) where helping people and business owner’s transition out of careers and their own companies is foremost. The last two divisions are meant to be proactive and preventative programs to help people and workplaces create change before they hit overwhelm, immobilization or full blown crisis. I want to give people the knowledge, skills and tools to function and manage better at work so they don’t end up in my therapy office when things go sideways. I view this as an investment – early skill building and intervention to ward off medical leaves and therapeutic treatment later. On a very personal note, my home life is enjoyable yet busy. Being married to the RCMP means that life revolves around shift work, transfers and the unexpected. My husband recently retired from The Force and now things are back in our control and a little less adventuresome. We enjoy time with friends, golfing and travelling. Our bucket list is not about things to accomplish before death but places, golf courses and wineries to try before old age hits. Individuals, couples and executives of all kinds and from all walks of life have gained new perspectives, made good decisions and created change to improve work, home and life. If you are close to your tipping point and ready to stop doing what doesn’t work, contact me. You can call 604-349-8660, email pam@pampaquet.com or click here to start a conversation.